Charges for issuing, passing or writing a bad check in Florence, Maple Shade, Medford, Moorestown, Mount Holly, Mount Laurel, Palmyra, Pemberton, Riverside Township, Southampton or Westampton Township can happen to anybody. For example, former New Jersey Assemblyman Robert Schroeder was charged and convicted with a second degree felony offense for issuing over $3 million in bad checks. In Robert Schroeder’s case, he was subsequently sentenced to eight (8) year prison sentence with thirty-six (36) months of parole ineligibility. This shows the seriousness with which New Jersey handles theft charges. For more information on the penalties for theft offenses involving bad checks, please read below. A conviction for a criminal offense will result in a criminal record and public embarrassment. That record may follow you throughout your life, including job interviews and professional boards. Do not let one momentary mistake haunt you for the rest of your life. Contact the criminal defense law firm of Proetta & Oliver for your criminal charges. Our firm is comprised of criminal defense attorneys and former New Jersey Deputy Attorney General. We have spent our careers fine-tuning our level of expertise and can offer our clients a individual-focused approach to their case. Call 609-850-8284 today and speak with an attorney today about your case. What is the Criminal Charge for Bad Checks, N.J.S.A. 2C:21-5? 2. That defendant knew at the time he/she issued or passed the check that it would not be honored by the drawee. Many defendants think that simply denying that they knew the check would bounce is sufficient to avoid conviction. This is simply not the case. The State can prove “presumed knowledge” if the defendant lacked a bank account at the relevant bank or if payment was refused by the drawee for lack of funds and the issuer failed to make good within 10 days after receiving notice of that refusal or after notice has been sent to the issuer’s last known address. Notice of refusal may be given to the issuer orally or in writing in any reasonable manner by any person. The grade or degree of this offense correlates directly to the amount of money involved. It is a crime of the second degree if the check or checks in question exceeds $75,000.00. It is a crime of the third degree if the check or checks are at least $1,000.00 but less than $75,000.00. It is a crime of the fourth degree if the check or checks range in value between $200.00 and $1,000.00. Finally, it is a disorderly persons offense if the check’s value does not reach $200.00. A disorderly persons offense differs from the other three because it is a misdemeanor that is non-indictable and is handled at the local municipal court. 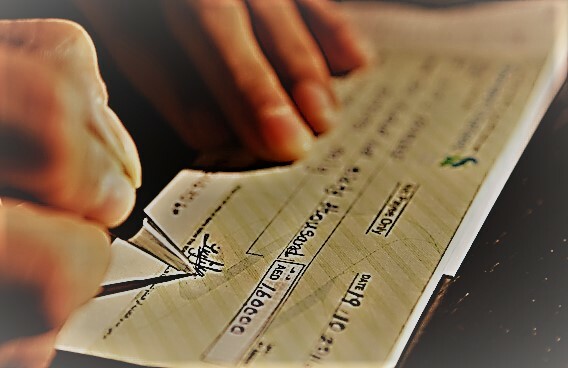 What are the Penalties for Writing Bad Checks in NJ? For a bad checks offense in the second degree, a defendant will face between five (5) and ten (10) years of incarceration, as well as a $150,000.00 fine. A conviction for bad checks in the third degree, carries between three (3) and five (5) years of incarceration, as well as, a $15,000.00 fine. If convicted for bad checks in the fourth degree, a defendant will face up to eighteen (18) months of incarceration, as well as, a $10,000.00 fine. Lastly, a disorderly persons conviction for bad checks, results in up to six (6) months incarceration, as well as, a $1,000.00 fine. Call 609-850-8284 today and speak with an attorney about what we can do to assist you or your family member with their case. We have handled thousands of theft cases throughout the years and can provide you with the experience necessary to fight your criminal charges.